13 episodes of cute girls suffering. At times, this anime seems like it's dark for darkness's sake. There's so many questions where the only answer might be "because suffering" or "because sadness" instead of anything related to the actual plot. Why do the bird and cat never help anybody? Why do the rules of who remembers the magical girls or not seem to change every episode? Why did SPOILER CHARACTER die if she was going to be revived later? What exactly are our main bad guy's powers and why do they seem to change all the time? It's a good show and I like how it ties back to the origin story at the end, but Daybreak Illusion gives you more questions than answers. Arcana and Magic Come Together in a Great Series! Day Break Illusion is a series about a group of magical girls whose powers and personalities are based on the Major Arcana cards of Tarot as they fight monsters born from humans that succumbed to despair. I found the whole premise of humans succumbing to despair and becoming monsters to be an interesting one and the addition of Arcana from the Tarot was even more interesting for this series. The only Arcana that make an appearance in this anime are The Sun, The Star, The Moon, The World, Wheel of Fortune, Temperance, Judgement, The Magician, and The Fool. Creatures that take advantage of the negative emotions of humans and then transform them into monsters are called Daemonia and they plague the world of this series. Girls from 22 special bloodlines are chosen to wield the powers of the Elemental Tarot and confront these Daemonia. 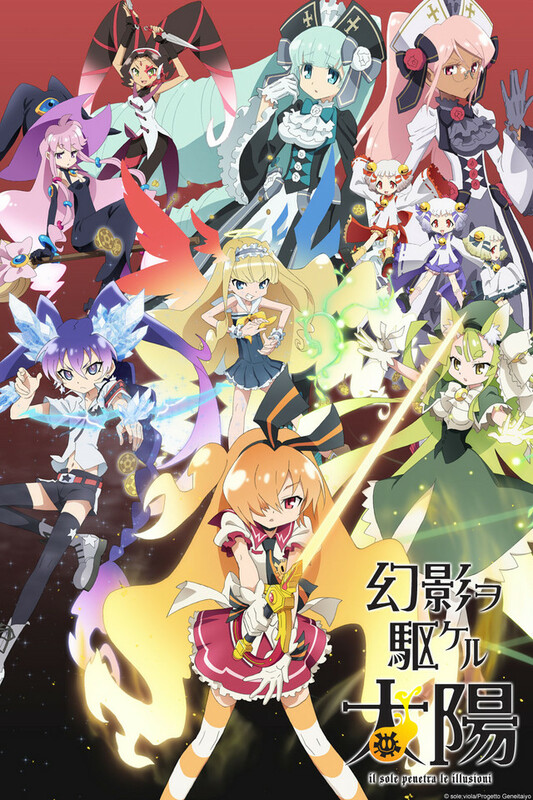 The 13 episodes of Day Break Illusion follow a young 12-year-old girl named Akari Taiyo who becomes the wielder of the card "The Sun" and joins the mysterious organization "Sefiro Fiore" that works to confront the Daemonia along with other chosen card wielders. However, it is not long until Akari learns that along with their duty to confront the Daemonia comes an unbearable guilt, as defeating the Daemonia means that the humans afflicted by them must perish along with these creatures as well. The plot of this series was really good. It was easy to follow and understand and I was very easy to keep an interest in fully watching the series from start to finish. My main interest in the series was to finish it to see just what Akari did and how she overcame the emotions that seemed to weigh her down from the beginning of the series. As well, the tory keep you interested in learning about the Daemonia and whether there are other options available to deal with them. All of the characters of this series all had their own unique personality and background. Although their personalities were mostly based on the Arcana that the characters' bloodlines were from, they are all likable. The characters of this series are shown to have some character growth over the course of this series as well. For example, the main character, Akari Taiyo, aims to be a fortune teller like her mother was and becomes The Sun one day when her cousin is turned into a Daemonia because of her jealousy of Akari. Over the course of the series, Akari learns to face her emotions and to overcome obstacles or anything difficult in her life. She also helps others with their issues as well, while working through her own issues. The character who is "The Star" card of the Major Arcana, Seria Hoshikawa seems really cold and strict like her ice powers and her bow and arrow, however she opens up to the other three girls who are the main characters of the series by the 13th, final, episode. Similarly, Luna who is "The Moon" card overcomes her own issues and grows into a more mature girl by the final episode as well. The final of the main group of four girls of the series, Ginka, who is the "Temperance" card of the Major Arcana, is not shown to really have any major issue like the other three girls but she helps the other girls with their problems and is very supportive and cheerful. The setting of this series is an interesting one. It seems to take place in the modern world, the one we live in, but then when the girls fight the Daemonia, they seem to go to another world, most likely to prevent damage to the real world they live in or because the Daemonia can influence the real world but actually live in another world. As stated, the setting of this series is very interesting. The art, or the animation, of this series was good. The Daemonia were very well animated, in a way that would be believable that creatures such as them could exist. Nothing about this series, in regards to the animation, was shown in any way that could have it difficult to believe that anything that looked that way could ever exist in reality. The sound, or the music, of this series is good. I enjoyed the opening theme, "Traumerei" by LiSA and the ending theme of "Mirage" by Natsumi Okamoto. They suited the series very well, although the transitions from the songs to the episodes seemed a little off depending on the episode. Day Break Illusion is a series that is very easy to enjoy. The whole idea of there being creatures who feed off of human despair is not one that is too difficult to grasp, therefore there is nothing that might strain the watcher's mind as they attempt to watch and enjoy this series. This series is really good and definitely worth watching if you are interested in Tarot and the Arcana. I would recommend giving this series a watch if you are in any way interested in Tarot and the Major Arcana cards of Tarot. I'm partial to magical girl anime this one has a very unique story but a lot like Magical Madoka. I think the story could have been a bit longer though! Animation is very good and the story line is a bit broken but you can understand the story a bit more if payed attention to. An Anime like Puella Magi Madoka Magica and super Great! I really like this Anime. I do not care what people think of this. Aniplex made an amazing anime like Puella Magi Madoka Magica. Since ancient times long past, this world has been ruled by two tarot cards. The main character of the story. Akari is cheerful and bright like the Sun itself, and has a hobby of fortune telling using Tarot Cards. She aims to be a fortune teller like her mother. After her cousin, Fuyuna, is possessed by Daemonia, Akari is forced to kill her, making her awaken her powers. Not long after, she gets an ability that lets her hear the Daemonia's voices. Akari is actually part-Daemonia, which is why she can hear the Daemonia's voices themselves. A calm but strict and icy-cold girl who has intense hatred on Daemonia after her childhood friend Manami was killed by them. She thinks of Akari's ability as a nuisance. The cheerful one of the group, Ginka speaks in kansai accent. She loves takoyaki and anything related to octopuses. She used to be poor. Her father mentions that Ginka's aunt held the Power of the Temperance card prior to Ginka. She disappears when she destroys her counterpart Daemonia. A shy, calm and modest girl who has healing powers. She was often bullied when she still lived with her rich family, and it is implied that she killed her older sister prior awakening her powers. Luna makes friends with Akari really fast. However, she starts to be romantically attracted to Akari and gets jealous of everyone else who is close to her, wanting to be the only one to protect her. She is later turned into a Daemonia by Cerebrum who was transformed into Akari, during her break from the academy. A shapeshifting villain who tempts people to become daemonia in order to collect their souls. The Art is Amazing and the OST is Awesome and the plot is very slow but over all this Anime is Epic and a great one to watch. This anime is very awesome and if you like Madoka Magica, I would recommend this Anime. Don't listen to those 1 and 2 star comments, watch the show. amazing graphics. even better story. "day break illusion." is an action packed story with personality and heart. this is a great story which follows Akari through her journey to becoming a "tarot user." the graphics were amazing and had real depth, and even the sad episodes were perfect. if you like action, life and teary eyes then this is the anime for you. the only complaint I have is that they don't explain the ending and you are left wanting to know what things meant, or why things happened. I was originally attracted to this anime because of it's unique art style, and that quirky blend of cute, dark, and angular lines is something that kept me happily watching: the art is, in my opinion, quite refreshing. The first episode started out slow, but picked up at the halfway mark, and this is generally how the episodes work throughout the series. The pace is slower than some other shows, but at the same time, they're pretty economical about what they show: pretty much every scene has a point (ie character development) or directly relates to the plot. That may not seem like a selling point, but if any of you have ever watched the original Sailor Moon anime, I'm sure you're familiar with "filler" episodes that follow a formula -- no such thing here, and at 13 episodes, that's a good thing. Many people compare it to Puella Magi Madoka Magica. I can see where they're coming from -- this show is all about exposing the 'dark side' of magical girldom -- but this show goes in a different direction with the idea. I've watched both and liked both for different reasons. I recommend heartily. Give this show a try!